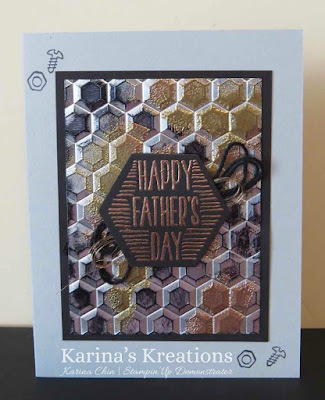 Karina's Kreations: Stampin'Up Tarnished Foil Nailed it Card! Stampin'Up Tarnished Foil Nailed it Card! This is a technique card that we're making Wednesday at my card class. 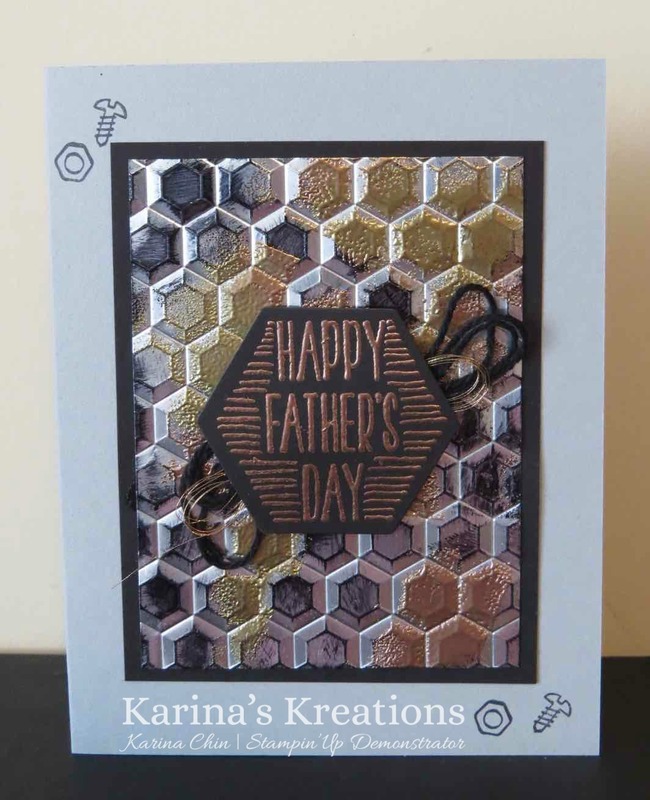 This is the tarnished foil technique using the Hexagon Dynamic Textured Impressions Embossing Folder #143231 and the Nailed it stamp set #143077. The technique uses Black Stazon ink #101406 which is retiring so make sure to order one before they are gone. Take a piece of Silver Foil #132178 and emboss it with the Hexagon folder. Rub Black Stazon ink over the foil and let dry. Rub versamark ink over the foil and emboss with Copper and Gold embossing powders. The greeting was stamped with Versamark ink on Basic Black card stock and cut out with theBuild it Framelit Dies. The dies are sold out but it a very easy image to cut out with paper snips. I added some Black Baker's Twine and Copper Metallic thread to the back of the greeting.